Material handling, that is what is defined as the movement, control, and storage of materials or products in various industrial settings, is perhaps the most common use for lifting equipment and hoists such as lever hoists. This process, which also requires the safe handling and protection of materials during an operation, requires efficient and reliable equipment to ensure that all of these conditions are met. One such piece of equipment, the lever hoist, is great for this. Why? We have explained more below. What is a lever hoist? This piece of equipment, which is also known as a pull lift, a lever chain hoist, or a ratchet lever hoist, is a compact piece of gear which is used for both lifting and lowering tasks, as well as tensioning or pulling tasks too. 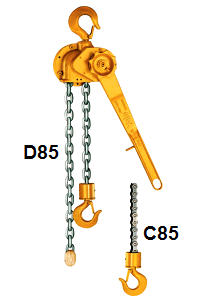 It uses a metal chain as its lifting medium, and provides for a versatile and lightweight solution with typical safe working loads of up to 10,000kg. Why are lever hoists so useful for material handling? So what do all of these benefits offer to a material handling operation? Total control, safety, and a secure holding position means that the user has full power over the handling of the materials that they are working with, rather than the other way round. Lever hoists are just one of the many types of hoist that we manufacture and stock, and we have a range of other products suitable for many other applications. If you would like to find out more, please contact us here.